Quicken 2013 produces a bunch of different reports. 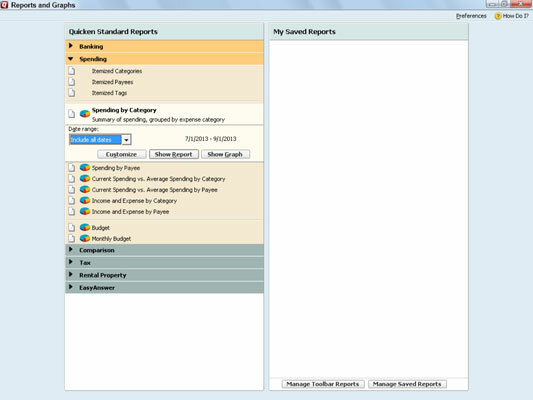 To print a report in Quicken 2013, just choose the Reports menu and tell Quicken which report you want to print. The transactions you enter in the transaction list window or a transaction form and the checks you enter in the Write Checks window determine the information available in a report. To make sense of what may otherwise become mass confusion, Quicken arranges all its reports into groups: Banking, Comparison, Investing (available when you’ve set up investment accounts), Net Worth & Balances, Spending, Tax, Rental Property (if you’re using Quicken Rental Property Manager), and Business (if you’re using Quicken Home & Business). To see the reports in one of these groups, click the Reports command and then select the report group from the Reports menu. As you may know, those little triangles to the right of menu commands tell you that another menu follows. 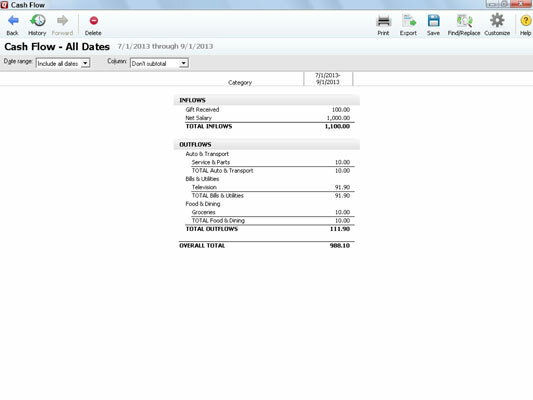 To create a Cash Flow report (or any other report), choose the report on the appropriate menu. For example, to create the Cash Flow report, choose the Reports→Banking→Cash Flow command. 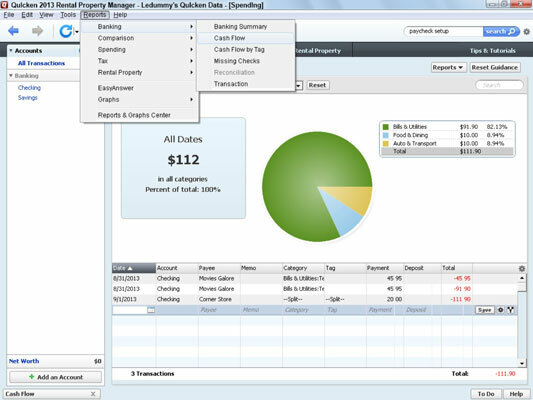 Quicken then creates the report, placing it in a newly opened window. After you create a report, you can change the report date or date range by using the boxes at the top of the report. To find out what type of information a report includes before you create the report or to preview a report, choose Reports→Reports & Graphs Center. This displays the Reports And Graphs window. Select a report group by clicking a topic on the left side, and then select the report with the report group that you want to create. You can’t see the entire onscreen version of a report unless your report is very small. Press the PgUp and PgDn keys to scroll up and down and use Tab and Shift+Tab to move right and left. Or if you’re a mouse lover, you can click and drag various pieces of the scroll bars. Print To: The Print To option buttons let you tell Quicken where it should send the report it produces: to the printer or to a disk file. If you choose to print it to a file, Quicken displays another dialog box you use to specify where the print file should be located and what the print file should be named. Print Range: Printing a long report? 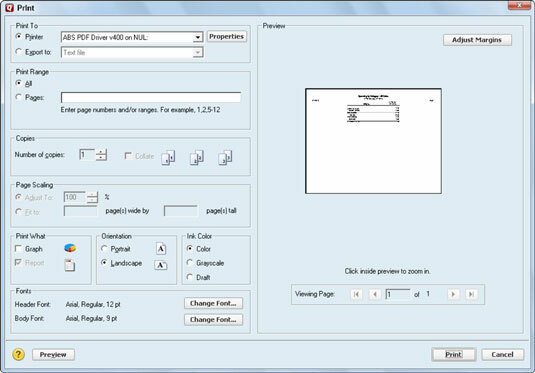 Consider using the Print Range option buttons and text box to specify that you want to print only a specified range of pages. As you might guess (if you’re a clever person), select the Pages option button and then specify the individual pages (separating each page by a comma) or the range of pages (separating the start and end page range with a hyphen). Copies: Use the Number of Copies text box to tell Quicken to print multiple copies of a report. Adjust Margins: Click the Adjust Margins button to add margin-setting boxes to the Preview area in the Print dialog box. After Quicken adds these margin-setting boxes, you can change the printed report’s margins by changing the margin settings.